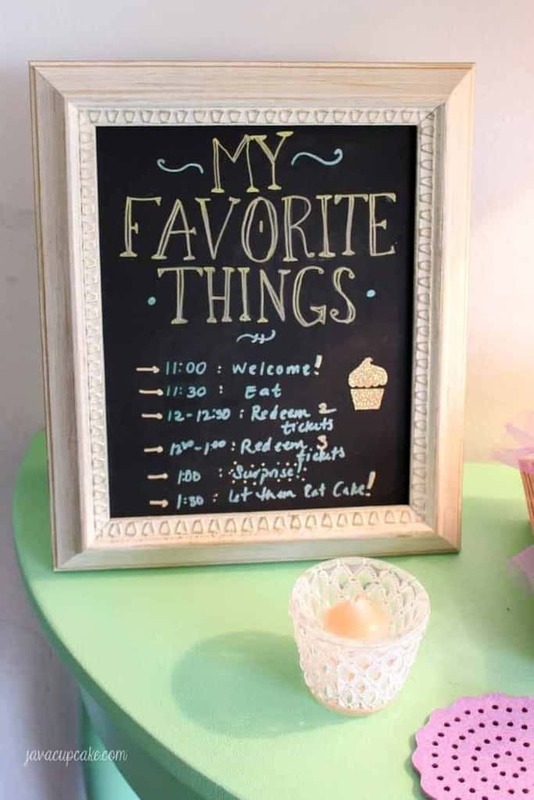 Spoil your best friends with a party filled with your favorite things by hosting a My Favorite Things Party! I’ve been living in Germany for the last 4 1/2 years and my time here is sadly coming to an end. 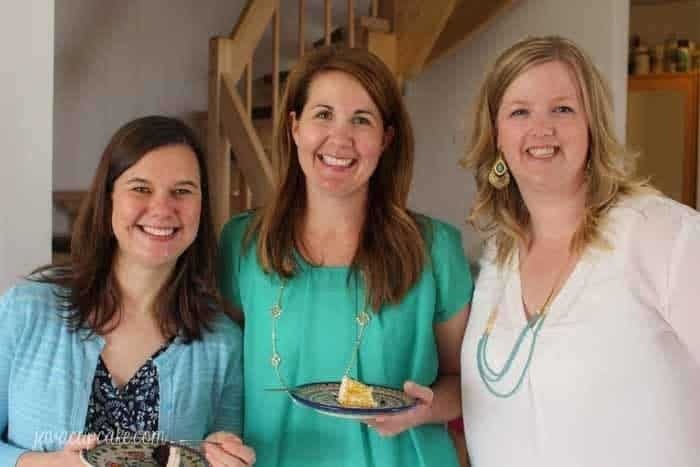 To celebrate the ladies that have made my life here special and who have become my Army Family I threw them a “My Favorite Things Party”! 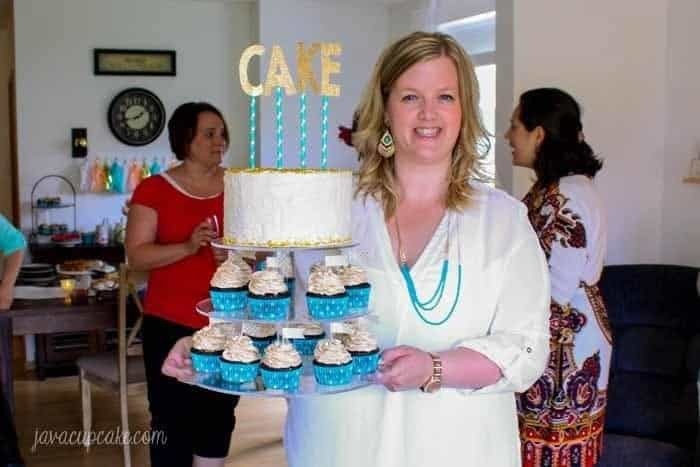 I originally got the idea for this party from my sweet friend Jenny Kelly of jenny cookies who hosted a MFTP in 2014. It looked like such a fun time, I wanted to throw one myself! If you’re not familiar with the concept of a MFTP, let me break it down for you. 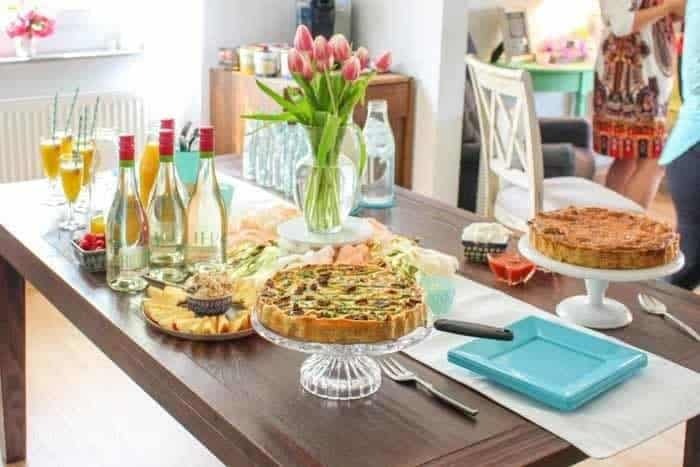 First, you invite a group of your favorite people over for brunch or maybe dinner and ask them to bring 5 of their favorite things to share with the party. 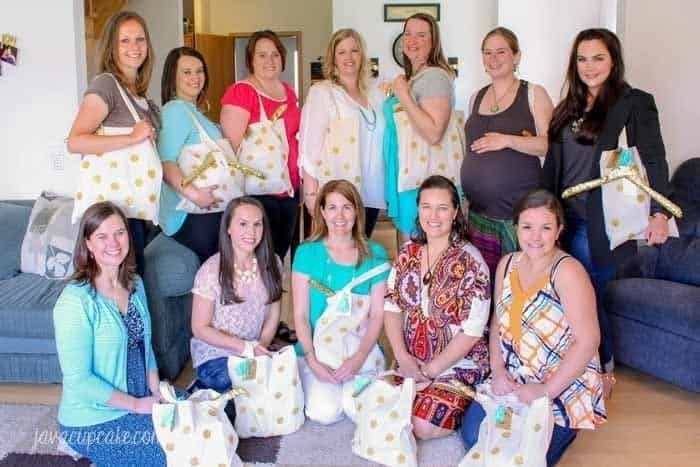 They should bring 5 of the same thing with a value of $5-10 each item. 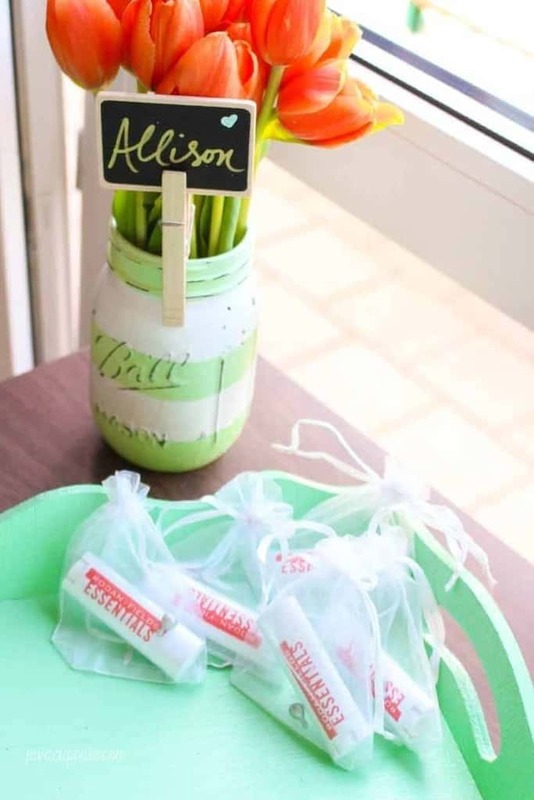 For example, I brought 5 painted mason jars filled with flowers. 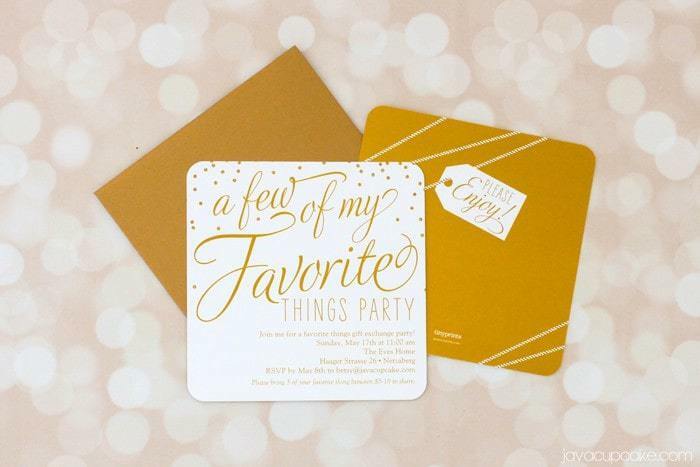 I ordered these super cute invitations from Tiny Prints which matched my gold color theme perfectly for this party! Other ideas include 5 of your favorite lipstick, 5 of your favorite book, 5 potted plants, 5 coffee mugs or even 5 Starbucks gift cards. The possibilities are endless, just encourage your friends to stay in the budget and think outside the box! 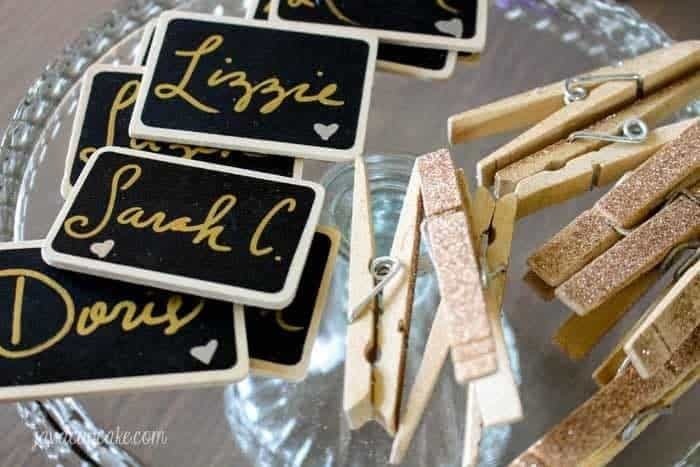 Once my friends arrived at the party, I had them find their name on a mini chalk board, pick up a DIY glitter clothespin and display their favorite thing on one of the trays I laid out around my living room. The mini chalk boards came in a 6 pack and were originally on a long skewer, but I popped those off so they could be displayed with my glitter clothes pins. 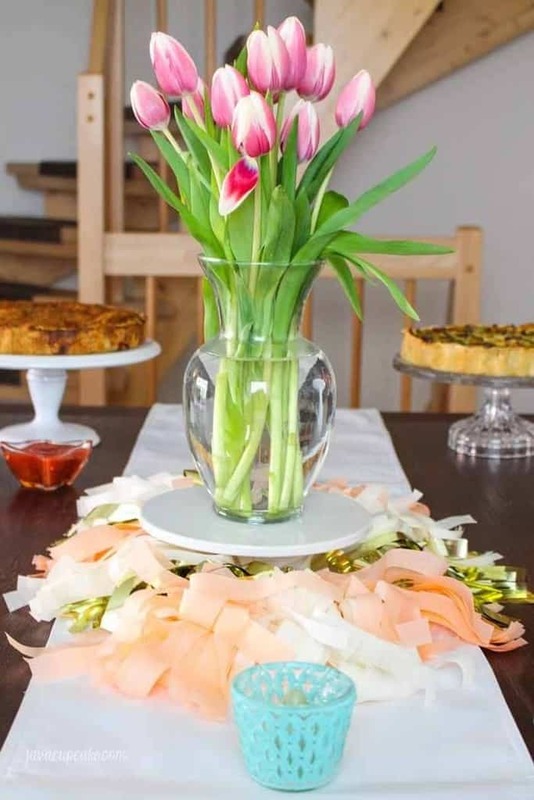 The color theme of the party was mint/aqua with gold, peach and white/cream. I wanted the party to feel light, fresh and full of color! I hung custom made tissue paper garland on the wall above the buffet and used a second garland on the table center piece. 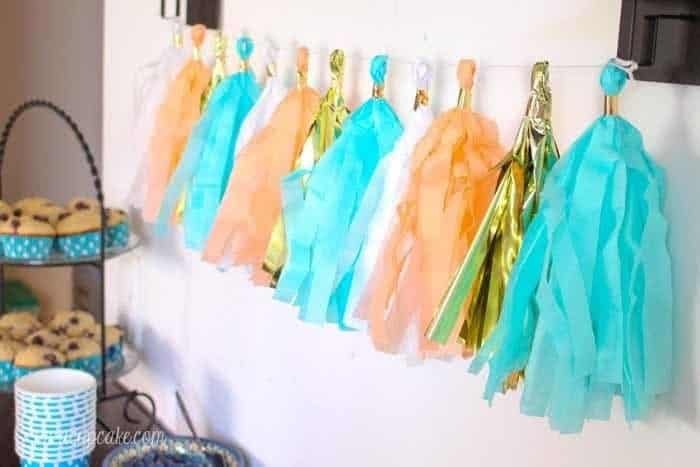 Love Garlands did an amazing job capturing the colors of my party! 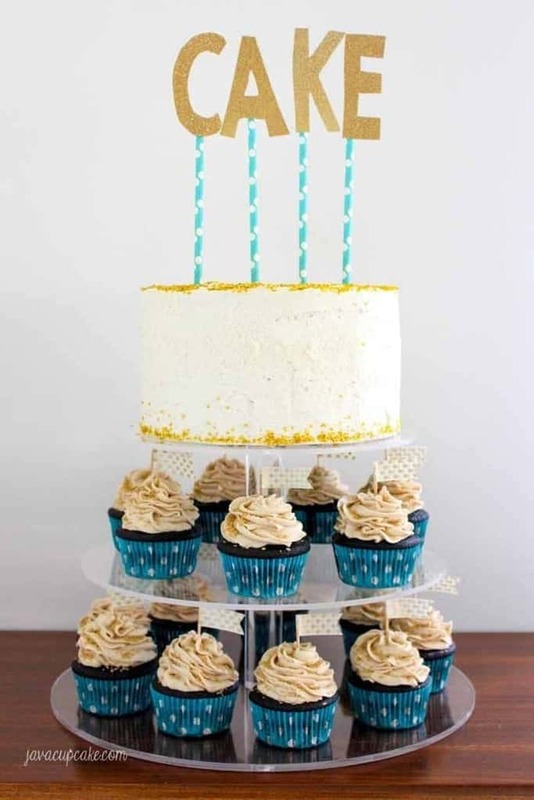 EXCLUSIVELY for JavaCupcake readers, Love Garlands is offering 15% off your next order using the code JAVACUPCAKE! I included fresh flowers every where I could. 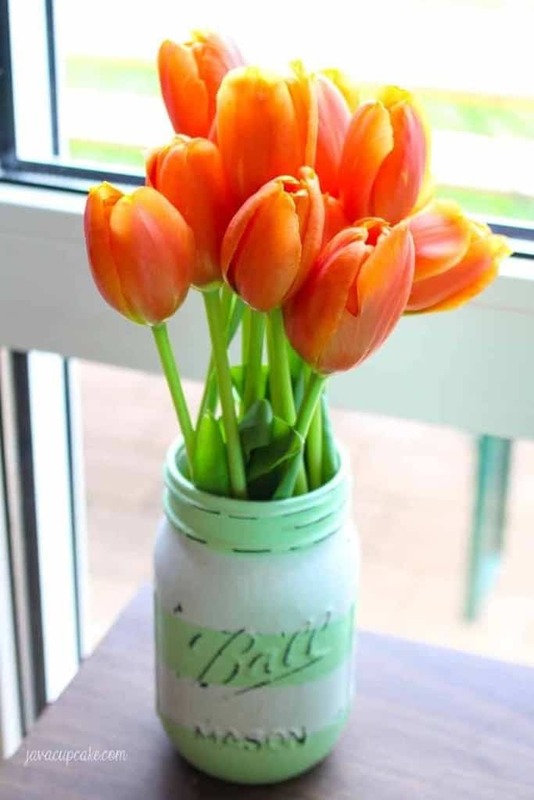 Tulips were in season, so I bought enough of them to fill every painted mason jar I owned plus a big bouquet as the centerpiece of my table. Since this was a Sunday brunch party, I served food that I could make ahead of time. 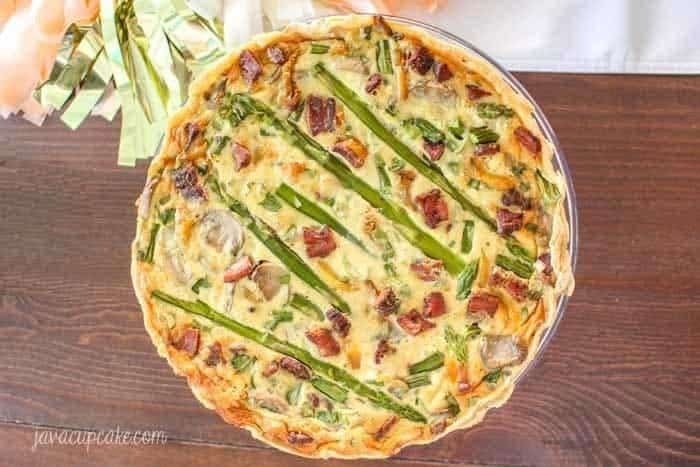 An asparagus bacon quiche, a Southwestern fajita quiche, a yogurt bar using cute paper bowls from Bake it Pretty, blueberry muffins baked in Sweets & Treats Boutique Bake Bright liners, fruit salad along with apples and peanut butter dip. 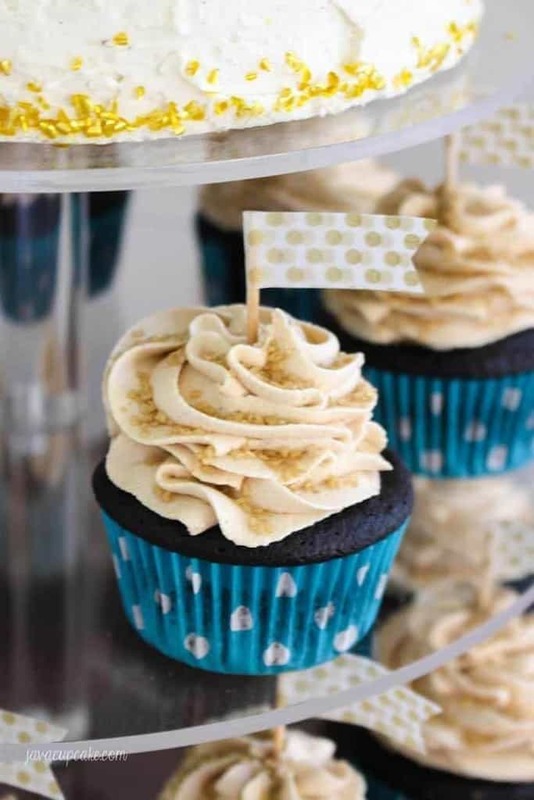 And finally… cake and cupcakes! And what’s brunch without mimosas? Orange juice plus bubbly champagne topped with fresh berries were the perfect addition to my brunch. 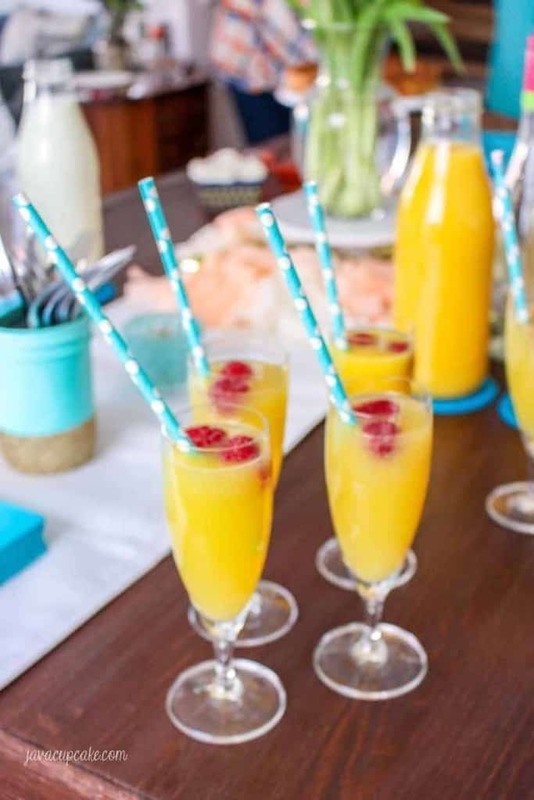 I served the mimosas in champagne flutes with matching paper straws from S&T Boutique. 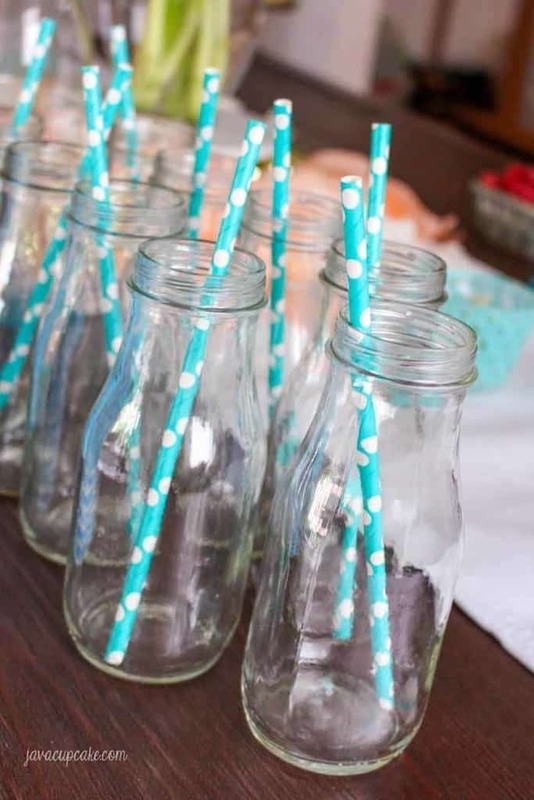 I also used recycled Starbucks Frappuccino bottles as milk bottles for those who didn’t want alcohol. 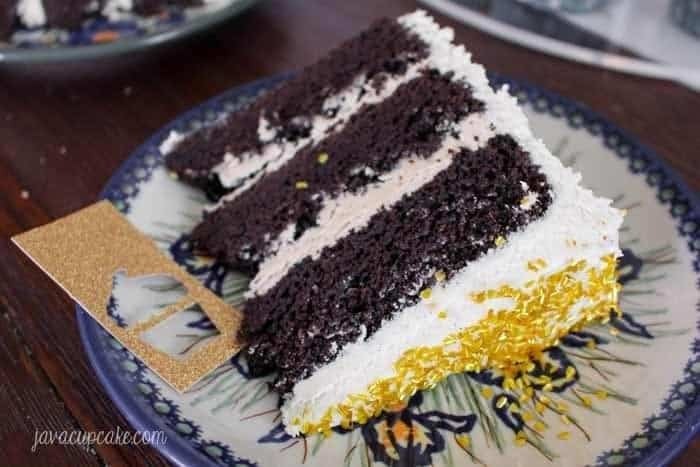 For dessert, I made a chocolate cake filled with peanut butter buttercream topped with vanilla bean buttercream garnished with edible gold flecks. 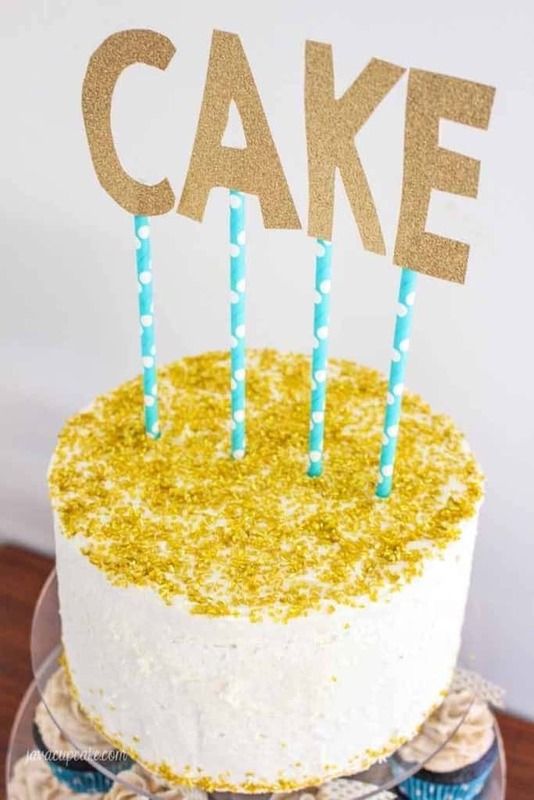 I even wanted my cake to be coordinated so I topped it with the word CAKE cut out from gold card stock paper and attached to S&T paper straws. The cupcakes are in matching liners and are pb&c too! Once everyone’s bellies were full, it was time to get the fun started! Our favorite things! Each person was given five gold tickets and during the allotted times, they could redeem tickets for items that others had brought. Before it was time to ‘shop’, each person told us what they brought and why it was their favorite thing. This allowed us to get a feel for what we could choose from and learn a bit about each other. It was really fun to see the variety in favorite things brought! 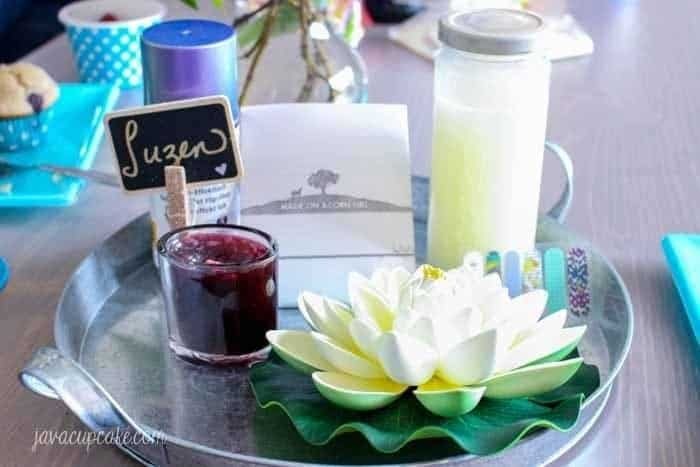 Some of my guests brought 5 different items, which was a fun twist! 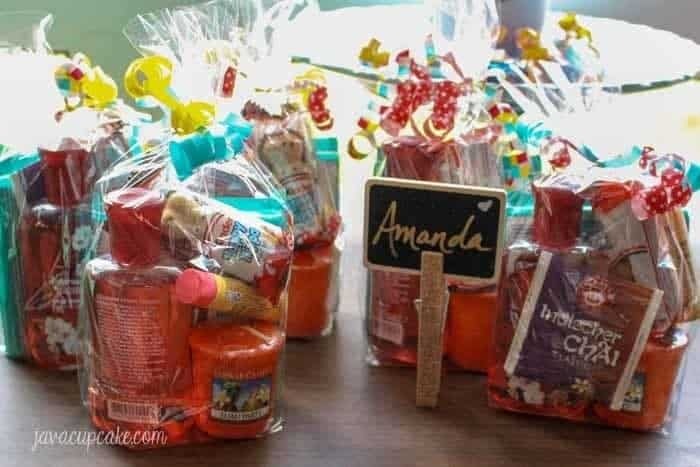 One person even brought five goodie bags full of her favorite things because she couldn’t just choose one thing! The possibilities are endless and really, there are no rules when it comes to your favorite things! 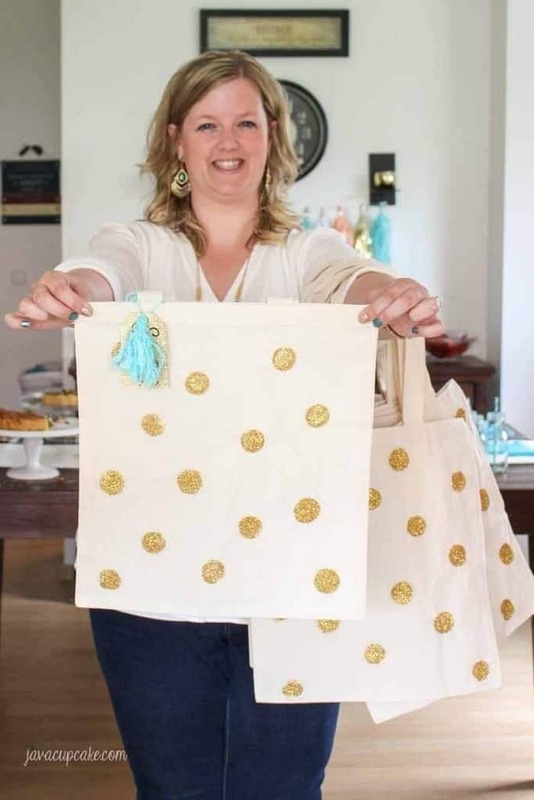 I made gold glitter dot tote bags for each of my guests to put their favorite things in. 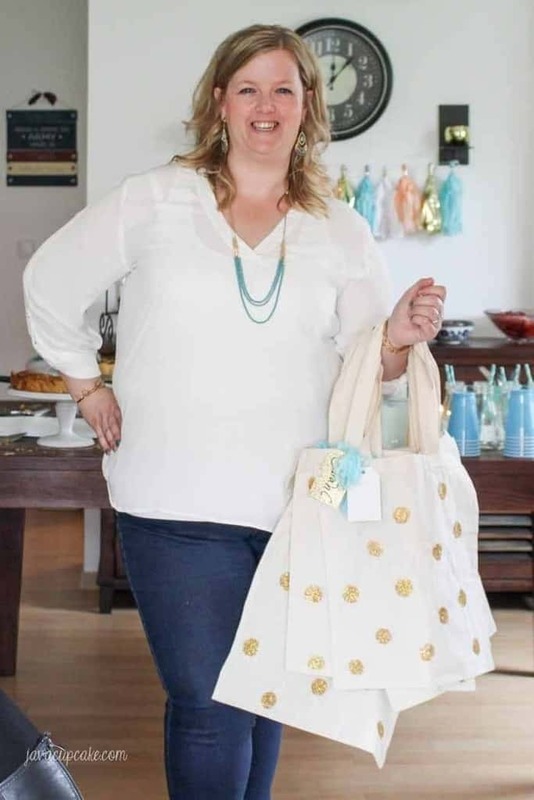 Each bag had a blue yarn tassel with their name on it to add a bit of a personal touch. This was a perfect way for my friends to store their items and carry them home in! I’ll be selling these tote bags in my new online boutique Cupcakes & Peonies later this year! After all the favorite things were chosen, I brought out some special extra favorite things to shower my friends with. First, I had custom notepads made from Tiny Prints with a friendship quote on the bottom. It reads, “A journey is best measured in friends, rather than miles.” (by Tim Cahill). 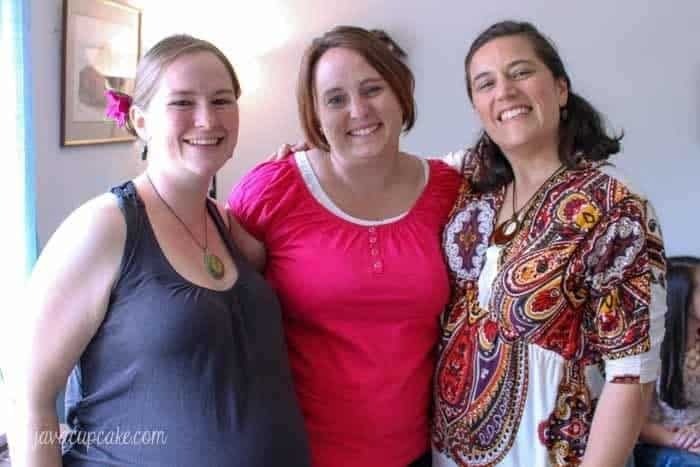 It’s a perfect quote for military spouses who are in each others lives for such a short period of time before moving… it’s not about the miles, it’s about the friendship and memories shared. I also had a journal custom made for each of my friends from Tiny Prints. I spent several hours picking out each journal special for each of my friends, making sure I thought they best matched their personality and style. Each journey had their names printed on them. 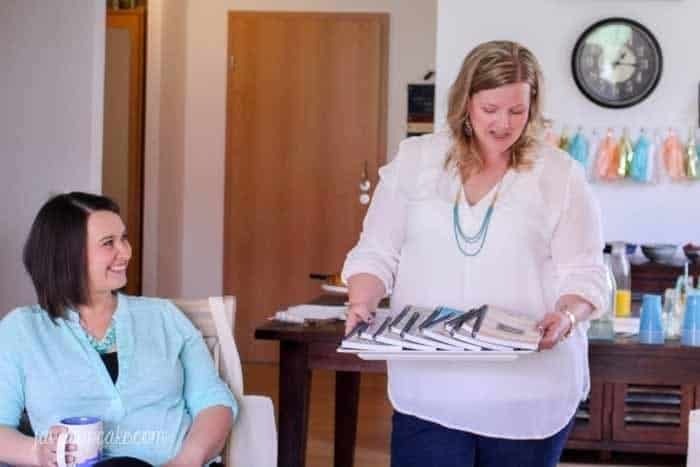 I told each person how much I loved and cared for them as I presented them their notebook… it was a an emotional gift… but so worth it to tell my friends how much I am thankful for them. 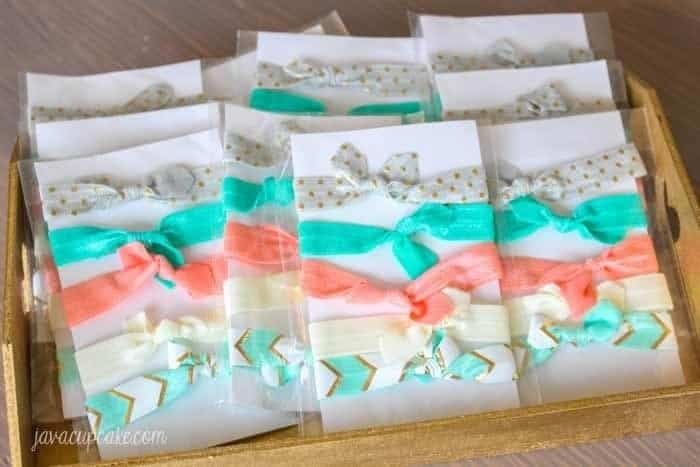 I am obsessed with elastic hair ties, so I ordered elastic from Inspire Away and custom made a set of elastic hair ties in the party colors. I wear one of these every day and they truly are my favorite thing! 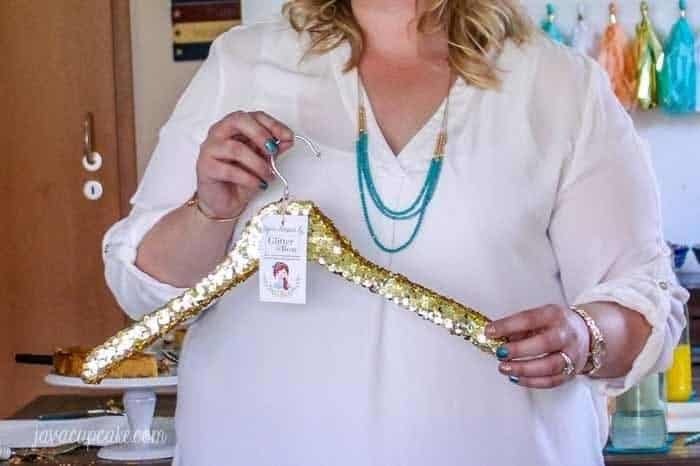 I was introduced to these gorgeous sequin hangers by a fellow Army wife here in Germany. 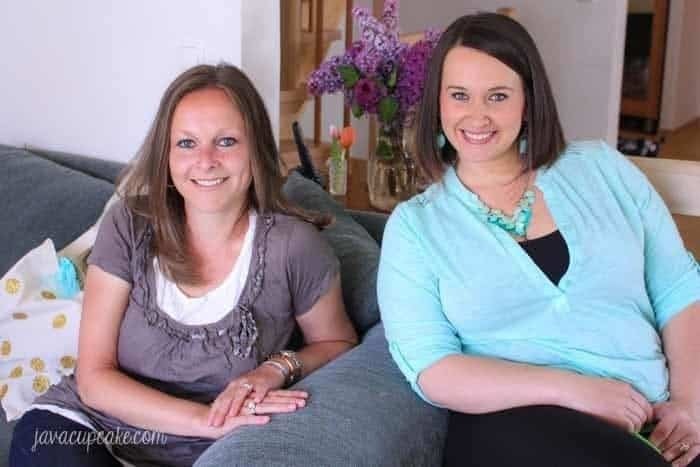 She makes them for her shop Glitter & Bow and has shared them with me and Emily over the last few years when she’s come over to do our hair/makeup for military balls. 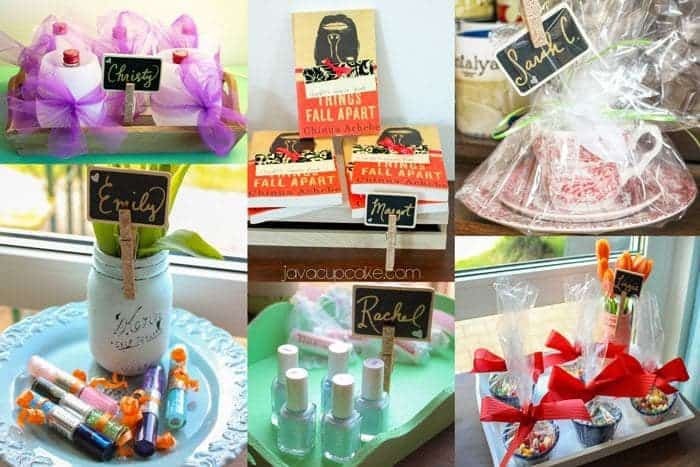 They are perfect to make your special day even more special. Each of my guests went home with one! This My Favorite Things Party was truly magical. I had never hosted anything so amazingly special before and I truly hope my guests felt important and loved. 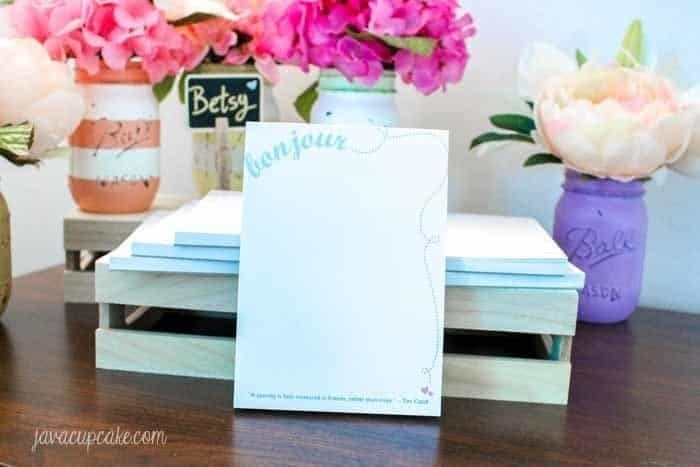 After the party was over, all the dishes were done and I had time to reflect on the day… I opened up the custom Thank You Notes I ordered from Tiny Prints to write a note to each of my guests. 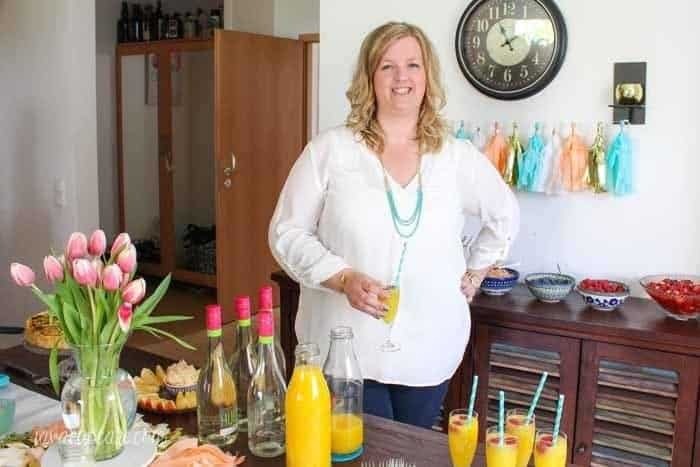 I wanted to thank them personally for coming to my party and for the impact they have had on my life… because ultimately, each person who came to my party was my favorite thing. Each person was special, important and influential in my life during the 4 1/2 years I lived in Germany. With the thank you note, I included a picture of each person and myself that was taken at the party. Please, make sure to check out all the amazing vendors I worked with to make My Favorite Things Party possible! These are some of the best people in their industry and I am blessed to know them! Simply enter the form below for your change to win! One winner will be chosen on Wednesday, July 1, 2015. Contest is open to USA and Europe residents only. Compensation was provided by Tiny Prints for this party, but all the ideas & words in the post are mine. Wow, I wish I had your energy! What a fun and beautiful party. So sad to hear your time in Germany is coming to a close, but what a way to leave on a high note! It’s been a fun 4+ years… but it’s time to come back to the USA. It was a great party!! Thanks for stopping by to see it! I miss Germany so much. If I was still there I would bring goodie bags of German Sweets. Specially Happy Hippos! lol My kids love those hippos, Allison!! Where did you live when you were in Germany? 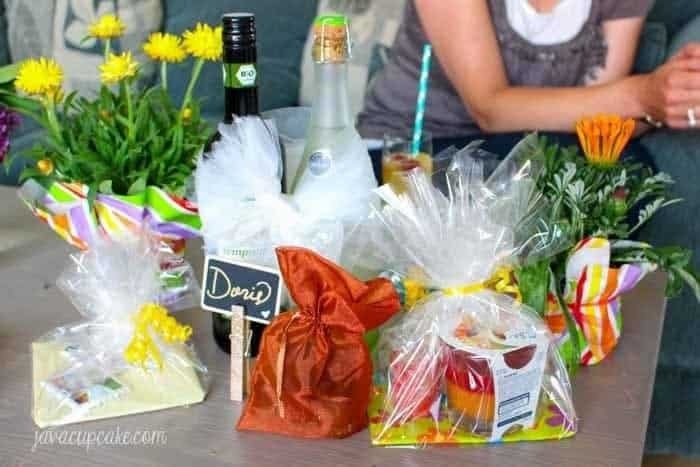 Great idea for a party! Oohhh I love that brand, Buxom, Heather!!!! Great choice! I would bring yummy smelling Philosophy Shower Gels for all the ladies. What a fun party! I’d probably bring a favorite book & my favorite lip gloss. What’s your favorite book, Kari? I would bring Mason jars. I’m obsessed with them right now! Me too, Julie… me too! I would bring a sarong. It’s my new favorite thing since we just moved to Hawaii. 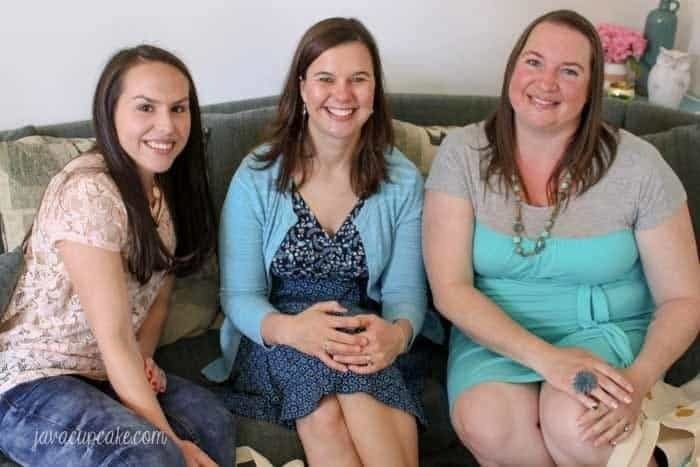 I love that I know two of your guests, Allison and Lizzie, from my Army life adventure. I would bring Nivea lip balm and Nielsen Massey Pure Vanilla Bean Paste. I love that lip balm and I love making ice cream with the vanilla bean paste!! I love both those things too Heather! I would bring a Fiestaware cake plate and server in you favorite color. I love mine. Oohhh I want one of those! What an awesome way to show your friends how much you care. This is a wonderful idea! Such a great post and I love everything that you displayed. Got myself a new idea. I love the decorative straws. Thanks Christy! I’m glad you enjoyed the party!! It was so much fun to put on! What flavor is that lotion Lyn? I would totally bring an Arc notebook from Staples for each person… I love mine, in fact I have about six of them. I’m going to have to google Arc notebooks… I’ve never heard of them. But like you, I’m obsessed with notebooks, pads and anything to write on! 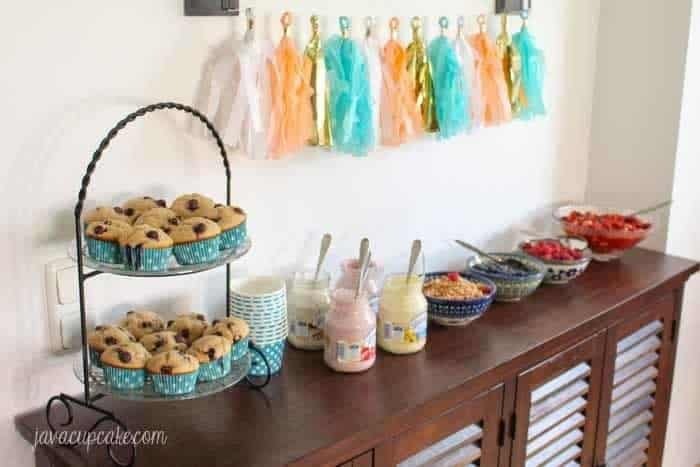 I would bring fun and funky grease less cupcake liners or parchment cupcake liners. Grease proof liners are my favorite! My new favorite obsession to make is lotion, lip balm and soap using sweet almond, honey and goat milk. Giving them to my friends and family makes me happy knowing that they’re getting something good for their skin that was made with them in mind. Oohhh how talented!!! I bet it just smells delish! I would definitely have to have some sort of tote bag and a bookmark. Those are 2 necessary things in my life. Hehehe! awww so sweet! That party is so beautiful-the perfect goodbye! I loved this. So sweet. !